Everyone on the same page now? I got lucky. I was underneath the sink, straining to unscrew a bunch of screws for a good 15 minutes before standing up to remove the faucet handles. I had barely touched the handle with my screwdriver when BAMZO. 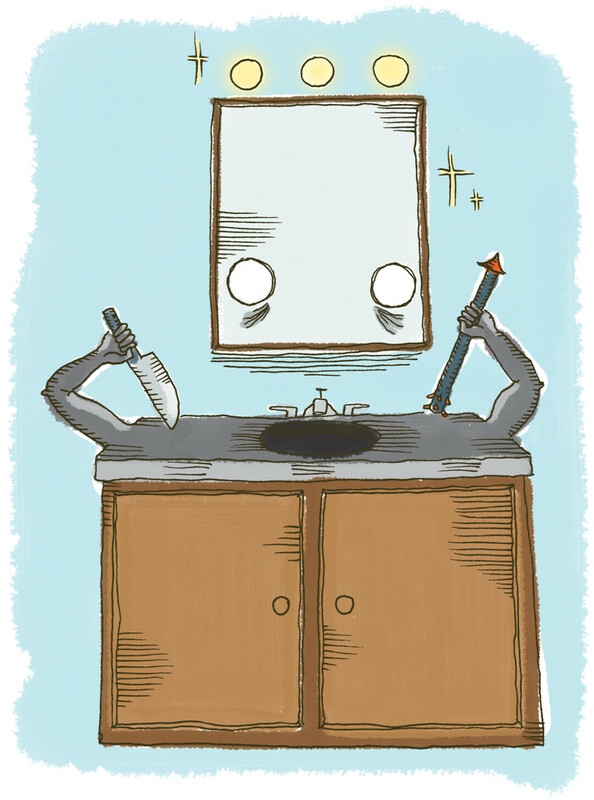 The sink slammed down into the cabinetry below, leaving a big gouge where the drain pipe stabbed into the painted wooden bottom. Like a spear. I’m not sure what was holding the heavy, old basin in place besides decades of dried hand soap residue and toothpaste. My wife gasped when I explained what had happened. I told her I didn’t want to think about what might have happened. I didn’t even want to talk about it. Until now, apparently. Enough time has passed, and I no longer shudder at that particular thought. Hey, wait a second. Let’s back up to an important detail. I replaced my bathroom sink. I removed the old one, installed a new one, upgraded the plumping a bit, and it doesn’t even leak. And I did it all by myself. * How cool is that? Very cool is how cool is that. ... because I was too lazy to tackle the project until the sink just finally broke, and I had no choice but to fix it. I couldn’t wait for reinforcements because the sink had broken on. And there was no way to shut it off without shutting off the water to the entire house. Which would mean no showers, no flushing of the toilet, no washing of the dishes, no cleaning of the cloths, and no cooking of the delicious food that somehow involves water. It was bad. I’d replace a few washers now and then, but the leak always returned, dripping and drizzling right out the spout. And other places. For a while, towards the end, if you turned on the hot water, a tiny stream of water would squirt from the cold water knob, arching into the sink. To taunt me. So I ripped the whole damn works right out of the counter. Or rather, I skillfully created an opportunity for the whole damn works to fall clean out of the vanity, almost crushing my face. And that’s about it. Miraculously, the rest of the job smoothly proceeded to the non-leaky sink my whole family enjoys today. I know what you’re thinking, but there’s no need to congratulate me. I’ve already done that all by myself. *With numerous calls to my father-in-law (who’s done this kind of thing a time or three), numerous discussions with my wife, and numerous trips to the hardware store where various helpful workers gave me good advice. Other than that? All me, baby.